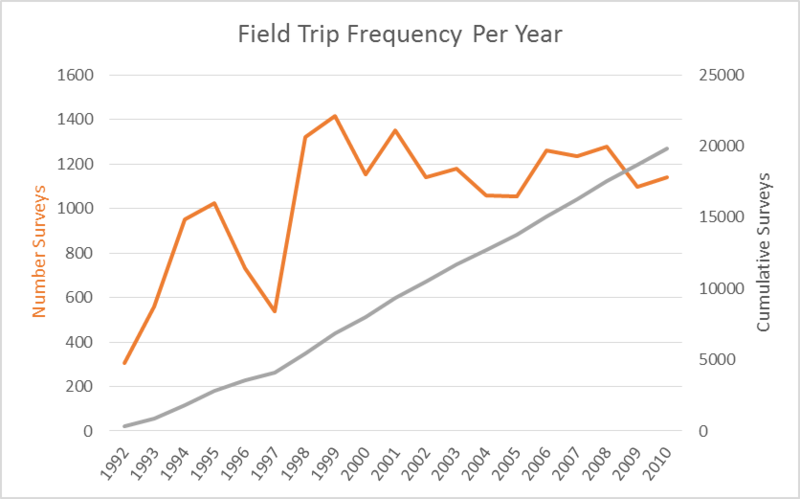 In this paper, data from almost 20,000 field trips were used to show climate related trends for the 100 most common butterfly species in Massachussets. First, the authors showed that there had been an overall warming trend in MA in all five climate zones over the past several years (Fig. 1a). During that time, abundances of southerly-distributed species had increased while those with a more northern distribution had decreased (Fig. 2a). Looking at species individually (Fig. 2), there was a range of responses, from those species showing significant declines (below -0.05 line), increases (above 0.05 line) and those with no significant trend (between dashed lines). Analysis shows that species that overwinter as eggs are more likely to show declines than those that overwinter at later stages. Further, common species are more likely to be declining that those often targeted for conservation efforts, especially if they were near the northern edge of their range. Zipf, L., Williams, E.H., Primack, R.B., and S. Stichter. 2017. Climate efects on late-season flight times of Massachusetts butterflies. International Journal of Biometeorology 61(9):1667-1673. Williams, E.H., Stichter, S., Hitchock, C., Polgar, C., and R.B. Primack. 2014. Phenological advancement of Lycaenid butterflies in Massachusetts. Journal of the Lepidopterists' Society 68(3):167-174. Stichter, Sharon. 2013a. Range expansion of Zabulon Skipper, Poanes zabulon (Boisduval & LeConte ) (Hesperidae) in Massachusetts. News of the Lepidopterists' Society 55:1. Stichter, Sharon. 2013b. Twentieth century range expansions in Massachusetts. News of the Lepidopterists' Society 55:3. Polgar, Caroline A., Richard B. Primack, Ernest H. Williams, Sharon Stichter, Colleen Hitchcock (2013) Climate effects on the flight period of Lycaenid butterflies in Massachusetts. Biological Conservation 160:25-31. G.A. Breed, S. Stichter, E.E. Crone (2013) Climate-driven changes in northeastern US butterfly communities. Nature Climate Change 3:142-145.